Reprinted from literature provided by Brookfield Renewable Power Co.
We who enter the Stone Valley Cooperative Recreation Area owe the pleasure to Lewis "Lew" Weeks (1920-1999) whose Power and vision brought many of us together to build and maintain trails in this special place for the benefit of all. Knowing Lew, we dedicate this to you, the visitor. Marvel and take care. The Stone Valley Cooperative Recreation Area, located in the towns of Colton and Parishville, offers an unusual opportunity for hiking, cross-country skiing, nature study, and historical exploration. There are several private land parcels in the Eastern section of the area, so please respect the property of others. The most specatcular stretch of Stone Valley is the mile between the hamlet of Colton and the Tub. Dramatic rapids in this section of the river flow over waterfalls creating gorges, rock islands, overhanging cliffs and facinating potholes. When the water is high it thunders through this section with awesome power, and is dangerously fast*. During times of low water, the exposed river channel presents a completely different aspect of the river environment. Beware, even during low-water periods. Sudden, unexpected releases from the dam can cause rapidly rising water, creating dangerous situations. Stay on the trail. The Stone Valley trail system also offers a unique variety of topography, woodlands, and tree plantations. Many different types of birds, plants and wildlife can be viewed along this diverse trail system, which is over 12 miles long. Informational plaques are locted at various points on the trails. Riverside trails are indicated by blue tree markers, access trails by dark red, and county trails by yellow markers. There are sections where caution should be exercised and others where trails are quite steep. For those who prefer a less rigorous hike, a fairly gentle incline will take one from the Northeast Trail Head to Cathedral Grove, a distance of one mile. O'Malley Brook flows through the Grove and tumbles down a rocky falls into the Raquette River beneath giant pine trees. The distance between trailheads on either side of the river is exactly 3.2 miles. To start at any trailhead and make a complete loop, down one side of the river and back to the trailhead of origin is a distance of 7.5 miles. The trails lie on lands owned by Brookfield Renewable Power, St. Lawrence County, and the Town of Colton. Brookfield Renewable Power, the Laurentian Chapter of the Adirondack Mountain Club and the St. Lawrence County Youth Conservation Corps maintain trails. If you have suggestions, or would like to participate in the stewardship of this area, contact Mark Simon at (315) 262-2571 or simonm@potsdam.edu. For your safety, please sign the trail registers at the beginning and end of your trip. *Note: for a look at the full force of the river during water releases, check out the Canoe & Kayak Stone Valley Kayaking page, reprinted here. 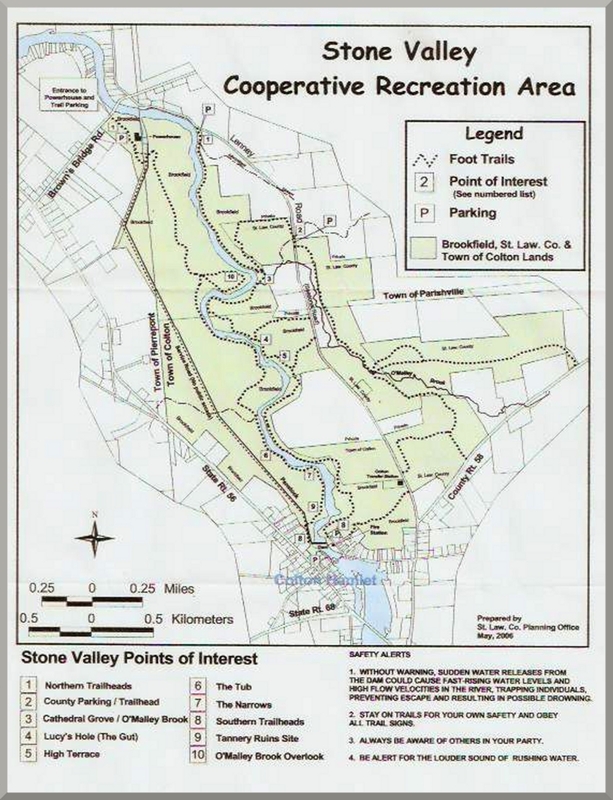 5/1/14: A notebook with information about Stone Valley and the entire 100-page management agreement (most of which is appendices of trail maps, owner policies, etc.) is available in the Town Hall. For your convenience, the ADK Laurentian Chapter has produced this wonderful online site to detail the agreement. It also includes details of the history and people who have contributed so much to Stone Valley.